Finely chop chives. Wash arugula. Add cream cheese and horseradish to a bowl and stir to combine. Set aside. Add eggs, milk, and chopped chives to a bowl and whisk to combine. Season with salt and pepper, then whisk in the flour. Heat vegetable oil in a nonstick pan over medium heat. Add half of the egg mixture and fry for approx. 2 – 3 min. until the egg is cooked. Flip the omelette and keep frying for approx. 1 min. Remove the omelette from the pan, then repeat with the remaining egg mixture. Spread some of the cream cheese mixture on each omelette, then top with smoked salmon and arugula. 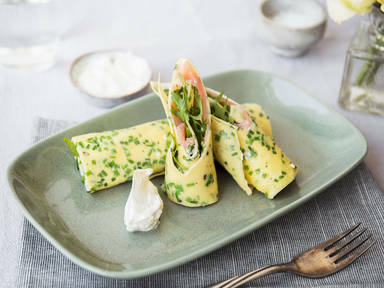 Carefully roll the omelette together to form a wrap. Cut in half on a diagonal and enjoy immediately!